Within the framework of the Ministerial Conference on Nuclear Science and Technology held at the headquarters of the International Atomic Energy Agency (IAEA) of the United Nations (UN) in Vienna, Austria; Ministers and high-level representatives from member states attend this space to address issues related to nuclear technologies and applications for peaceful purposes, and to the IAEA’s technical cooperation program. Ambassador Jesse Chacón, permanent representative before international organizations, reaffirmed once again, during his speech, that the Bolivarian Republic of Venezuela is unquestionably pacifist, attached to the defense of complete and non-discriminatory disarmament; attached to the principles, rules, spirit and work of the international atomic energy agency. Also, the Venezuelan diplomat said that the country gives him the strongest support and recognition in the agency’s task on promoting the development of nuclear technology, and highlights the importance of facilitating its transfer to developing countries, so they can benefit in the different sectors of national development, such as human health, agriculture, food, environment; all this with the ultimate goal of improving the life quality of citizens. 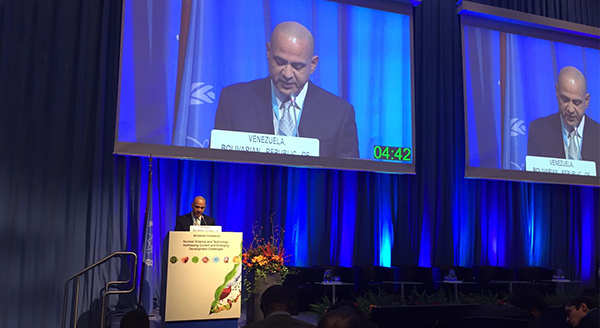 Regarding the activities carried out at the national level, it was highlighted that the implementation of the technical cooperation program in Venezuela with the agency has played a strategic role in strengthening the capacities in the management of water resources; cancer, environment, radiological and industrial safety management; and has contributed to the development of research projects. During the 2018-2019 cycle, Venezuela has 4 projects, two in terms of human health, one on radiological and environmental protection and the last on strengthening the national infrastructure in radiological, technological and physical safety. Likewise, in this period the country is participating in 15 regional projects within the framework of Arcal. He also explained that with the signing of the national programmatic framework on September 11, 2018, a strategic role will be achieved in the planning of projects and programs in the different areas and sectors. On the other hand, the Ambassador reiterated that the Venezuelan state considers the technical assistance of the OIEA essential to contribute to the development and prosperity of the peoples and, therefore, should not be subject to political, economic, military or any other type of conditions. that are incompatible with the provisions of the body’s statute. The Bolivarian government places special emphasis on multilateralism through dialogue, peace and diplomacy, as a meeting place for recognition among sovereign States and for the resolution of conflicts through negotiations under conditions of mutual understanding. “We are a country of peace and we consider dialogue as a sacred way to build peace, prosperity and development in all the countries of the world”, said the diplomat. The Venezuelan State will hold monthly meetings to address joint issues with the United Nations system.